As we near the holiday season we start to think of the festive meals to come with family and friends. It’s always a nice surprise when someone brings something different to the party for everyone to try. Why not let that be you this year? We have a recipe in mind that you are sure to love and share with your loved ones. It’s a classic that we have previously introduced to our fellow brewers and is one worth trying. Cranberry Orange Kombucha. Lightly sweet, tangy and great with your hearty meals or enjoy as a desert drink to cap it off. 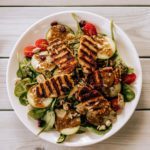 It has the taste of the holidays with less of the sugar and more of the probiotic benefits to help you digest the wonderful food you are bound to eat. So when you are thinking about bringing that turkey out, imagine getting to serve a nice bubbly cranberry kombucha to go with it. When people ask what kombucha is, it’s your time to shine and explain to them how they are drinking something that is not only delicious, but good for you. 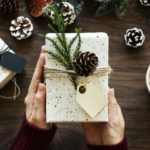 Since the holiday season is a while away, now is the time to test out a batch and make the necessary adjustments you need to make it your own. This recipe will make about 4 cups or 1 Litre of kombucha. Simply adjust the recipe proportionally if you want to make bigger batches to bring to parties, or, just have more for yourself. If you want to try making it even more festive, try adding a few pinches of cinnamon to the recipe to give it a nice mulled wine like flavor. Keep in mind that the instructions above are for the second fermentation when making kombucha. 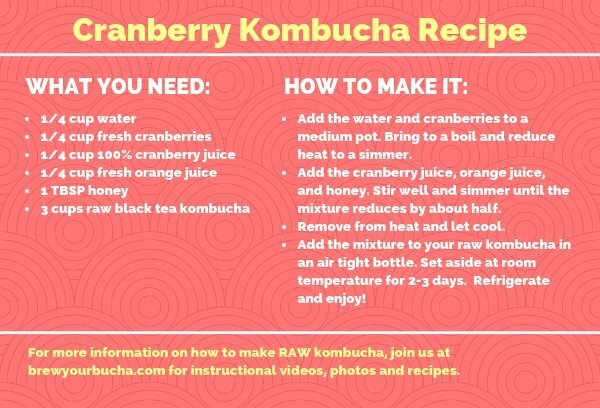 If you are interested in making Cranberry Orange Kombucha but do not know how to make raw kombucha, please check out our Learn page to get a video and photo tutorial or our Blog to get even more information. You can also visit our Shop to browse our many Kombucha Starter Kits, Tea and Accessories. If you are going to be giving out bottles of kombucha as gifts, or bringing it to a party like a fine bottle of wine, consider our premium quality kombucha bottles which are ideal for nice, bubbly kombucha. They are also on sale leading up to the holiday season so definitely do not miss out. Have any questions? be sure to reach out to us on our live chat.